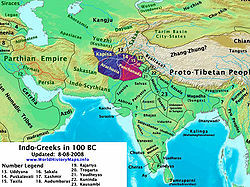 The Indo-Greek Kingdom was a part of the Greek Empire. It ruled in parts of northwest and northern Indian subcontinent (present-day Pakistan) from 180 BCE to around 10 CE, and was ruled by a succession of more than thirty Hellenic kings. This page was last changed on 31 August 2017, at 03:56.